L'Oreal INFALLIBLE and I've been friends since mid-2016. In six months, we've gone to various destinations both local and foreign and it's always kept my make-up on point. Minimal touch-ups here and there, no smears nor serious meltdowns. The best part is -- it's almost always on sale! 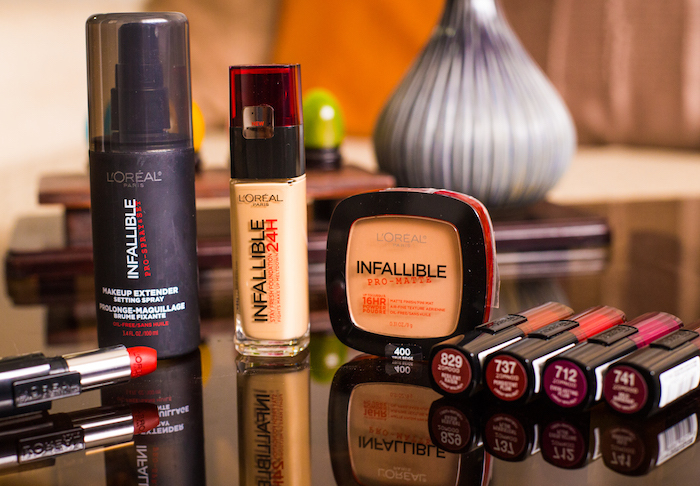 Two weeks ago, L'Oreal challenged me to try out the INFALLIBLE range through an electrifying (read: your tita got wiped out) workout. Their promise? That the INFALLIBLE 24hr Foundation (Php 700) is sweat-proof, the INFALLIBLE 16HR Pro-Matte Powder (Php 600) topped with the INFALLIBLE Pro-Spray & Set Makeup Extender & Setting Spray (Php 500) can withstand harsh lights, wind, and smoke, and that the INFALLIBLE 10hr Lipstick (Php 500) is food-proof. How do you think did the range fare? 5:35PM Had my INFALLIBLE makeover. We used the INFALLIBLE 24hr Foundation in 120 and INFALLIBLE 10hr Lipstick in Resilient Raisin. 5:47PM Catch up with Shenny! YAY! 6:15PM Shimmied my behind to the 30 minute workout. 6:50PM Pat my sweat dry. Nice to see my makeup intact (!!!). 7:10PM Put on some INFALLIBLE 16HR Pro-Matte Powder in 200 and locked it in place thanks to the INFALLIBLE Pro-Spray Set Makeup Extender Setting Spray. 7:30PM Went to the nearby mall, had brekky (I work evenings). 8:30PM Arrived at work, didn't have to touch up on my lipstick. Blot my t-zone using just 1 oil control sheet. This is big since I almost always use 2-3 sheets. 11:30PM Had my second cup of coffee through a mug. Minimal stain on the mug. 5:30AM WOOHOO another day's done! I'm able to survive another busy workday without worrying about my makeup. My lipstick's faded significantly but left a nice and even stain. My facial makeup's stayed much longer this time around than when I tested it in the US during summer. It's also left me with a nice and second-skin, dewy finish.